One way to generate electricity is to burn solid waste, like the material found in landfills. Instead of a traditional landfill, a community might have a waste-to-energy facility that incinerates garbage, transforming chemical energy to thermal energy. That thermal energy is transformed into electrical energy, usually by turning a turbine. Another energy resource that comes from our garbage is the methane gas that is produced as the waste decays. This gas can be used as fuel. Click on parts of the interactive explainer to learn how waste is converted into energy. Hundreds of waste-to-energy plants are in operation in Europe and there are around 90 in the U.S. Although incineration has been around for centuries, modern waste-to-energy facilities must meet strict guidelines to capture pollutants, like dioxin, that would normally be released into the air. This interactive explainer is featured in our Energy e-book series. Click on the thumbnails below to download our free e-books or subscribe to our iTunes U course. You can also visit our e-books page to view our other offerings. 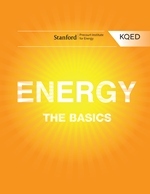 Examine the science of energy, from what it is to where it comes from. Explore how humans use energy — from generating electricity to developing energy-efficient technologies. How much energy do we make in a year with that trash?